With Mother’s Day quickly approaching (that’s Wednesday, May 10th or Sunday, May 14th, depending on where you live), do you know what you’re getting Mom? 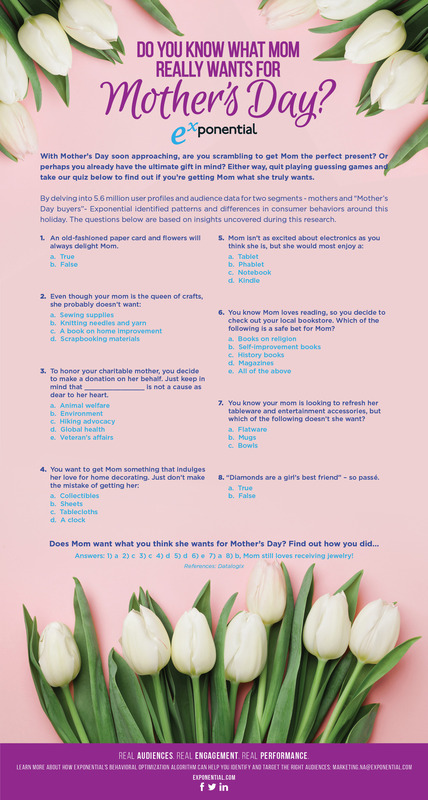 Take the quiz below to find out if Mom really wants what you think she wants. Otherwise, there’s still time to revise your game plan! To garner these insights, Exponential dove into 5.6 million user profiles, audience data for two segments (mothers and “Mother’s Day buyers”), and identified patterns in consumer behaviors around this holiday. Learn more about how Exponential’s behavioral optimization algorithm can help you identify and target the right audiences at exponential.com or by contacting marketing.na@exponential.com.